Nebraska is among the favorites to win the Big Ten West Division in 2014. The Nebraska Cornhuskers are coming off a 9-4 season in 2013 with losses to UCLA, Minnesota, Michigan State and Iowa all by double digits. The season was highlighted by an upset win at Michigan. Nebraska looks to build on a 9 win season last year will 11 starters. There were some rumors head coach Bo Pelini was to be fired at the end of last year but he does return in 2014. Nebraska is one of the favorites to win the Big Ten West division along with Iowa and Wisconsin. Nebraska averaged 216 rushing yards and 197 passing yards per game along with 32 points per game. Five starters return on offense. Last season, Tommy Armstrong, Jr., Ron Kellogg III and Taylor Martinez split the snaps at quarterback. Each took about a third of the snaps. Kellogg and Martinez have both graduated. Armstrong will be the starter exclusively barring injury. He completed 51.9% of his passes for 966 yards with 9 touchdowns and 8 interceptions, along with 67 carries 202 yards and 2 touchdowns. 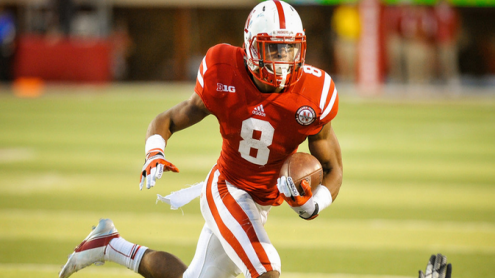 Running back Ameer Abdullah returns after some rumors about leaving early for the NFL. Abdullah 281 carries for 1,690 yards with 9 touchdowns, plus 26 catches, 232 yards and 2 touchdowns. Imani Cross also returns after he had 85 carries for 447 yards and 10 touchdowns. Nebraska must replace leading receiver Quincy Enunwa now with the New York Jets. Kenny Bell looks to become the leading receiver in Nebraska history this season. Bell had 52 catches for 577 yards with 4 touchdowns. Jordan Westerkamp, Sam Burtch, and Jamal Turner will also get a lot of targets. Turner looks to remain healthy in 2014 after being hampered by injuries last season. The offensive line will be a different unit in 2014 with some new faces. Left guard Jake Cotton will anchor the line. Colorado transfer Alex Lewis has potential at left tackle. The defense gave up 371 yards per game and 25 points per game last season. Nebraska returns 6 starters in 2014 on defense. Last year was the first in a few years that the defense actually started living up to the school’s vaunted “Black Shirt” defense reputation. Defensive end Randy Gregory led the Big Ten with 10.5 sacks last season. He is an All-American candidate. Tackles Vincent Valentine and Maliek Collins, both sophomores are strong fixtures on the interior of the line. The linebackers are a unit with a lot of depth led by Trevor Roach, who missed all of last season with an injury. David Santos, Michael Rose and Josh Banderas are also key contributors. Safety Corey Cooper and cornerback Josh Mitchell have combined for 32 starts in their career. Both are among the team’s leaders. Kicker Mauro Bondi, a kickoff specialist last year will compete with true freshman Drew Brown to replace kicker pat Smith. Former walk-on Sam Foltz returns at punter. The Cornhuskers hope incoming freshman Glenn Irons will be the answer to their woeful punt return team from a year ago. Kenny Bell led the Big Ten in kick return average and even had a 99 yard return for a touchdown against Penn State. Nebraska should have little trouble with Florida Atlantic and McNeese State in Lincoln. However the Cornhuskers then have tough non-conference games at Fresno State and at home against Miami-(FL). In Big Ten play, Nebraska has home games against Illinois, Rutgers, Purdue and Minnesota. The Cornhuskers travel to Michigan State, Northwestern, Wisconsin and Iowa. I think Nebraska wins 8 games but loses out to Wisconsin for the West Division title.